These two share one name and not much else. One looks genteel and refined. The other is dark and edgy, a certified bad boy in designer Goth. The guy on the right didn’t have an invite. I’ll let Leigh talk about him some other time. The respectable member of the brood is the Ogiva. Its torpedo silhouette is a 1927 design, launched at a time when Irving Berlin, Duke Ellington and the Gershwins were all the rage. Style was a non-negotiable commodity and the Ogiva never had to plead for anyone’s sympathies. 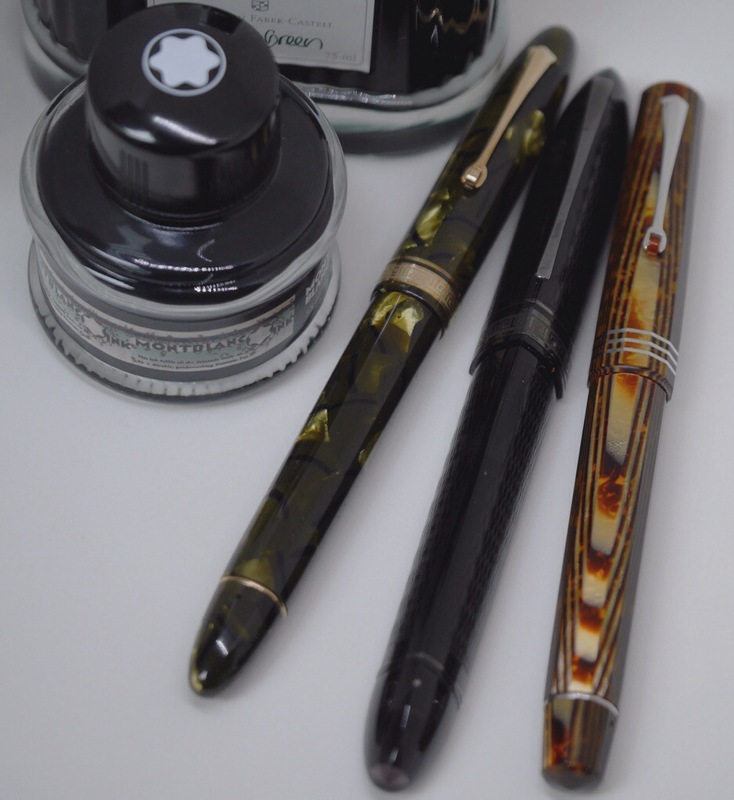 Over decades, not once did it lose its sense of élan and OMAS have made it available in various sizes and materials, keeping it tasteful and attractive regardless of what fashions prevailed. 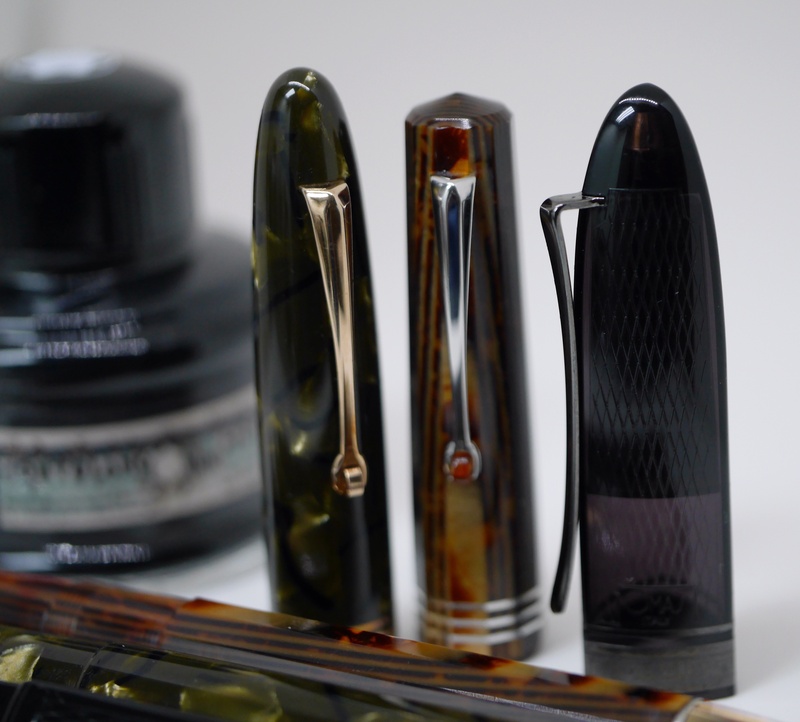 OMAS draped this particular pen in a wonderful celluloid material called Saft Green. Granting a slight nod to modern tastes, rose gold was chosen for this Ogiva’s decor. The pink hues cast a warm and more welcoming look compared to the rather vibrant moods of yellow gold. While the rose gold rage will fade soon enough, this treatment, like a pair of bespoke Balmorals, will survive the ebb and flow of fads. One will dance if it likes your tune. The other headbangs. Then we have the offspring from a totally different era. This one doesn’t swing to bebop but bangs to the likes of LL Cool J, the Notorious B.I.G. and Bone Thugs-N-Harmony. The 360 came about in 1996, in the middle of a decade committed to insane (read: tacky) opulence and a worldwide obsession with technology and the Internet. Not exactly an ideal period for writing instruments, let alone new designs. 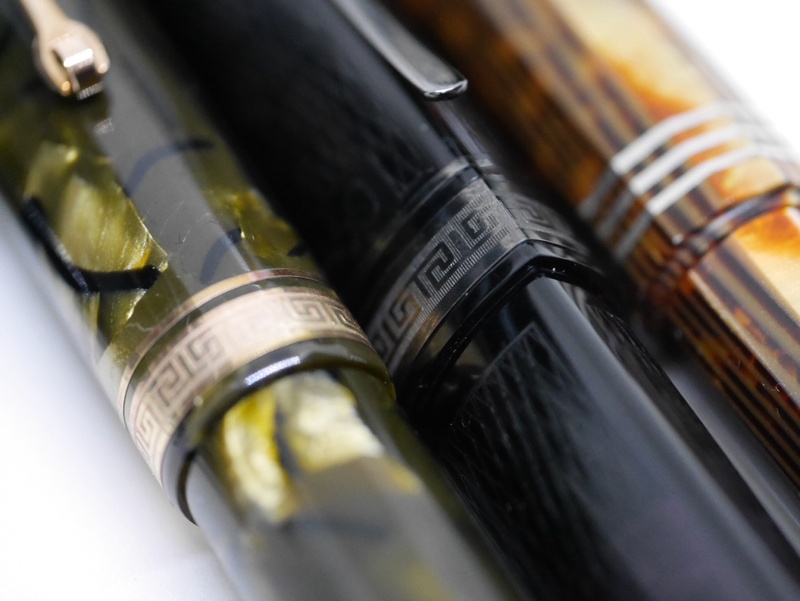 But OMAS boldly took up the cause that the Triad Pen Company unsuccessfully championed in the 1930s and introduced a pen with a triangular cross-section. Round isn’t the only shape out there. Of course, the immediate question is, “Why?” Round and even faceted shapes worked so well for so many hands. What did a triangular shape bring to an admittedly cramped table? A few years ago, I would have said, “Nothing.” But a pen friend I respect tremendously told me that the 360 is the most ergonomic pen she had ever used. Now she has an impressive collection of really nice pens and doesn’t impress easily. At all. So her unusually high praise is what I considered a clue. Of course, she was right. The 360 shape doesn’t look like it’ll work but if your grip is close to what the schoolmarms insisted on, it’ll fit you like a pair of well-worn Luchesses. Look closer and you’ll see that black isn’t always completely so. This model is wrought from cotton resin, which thankfully makes it a little more accessible than its older sibling. 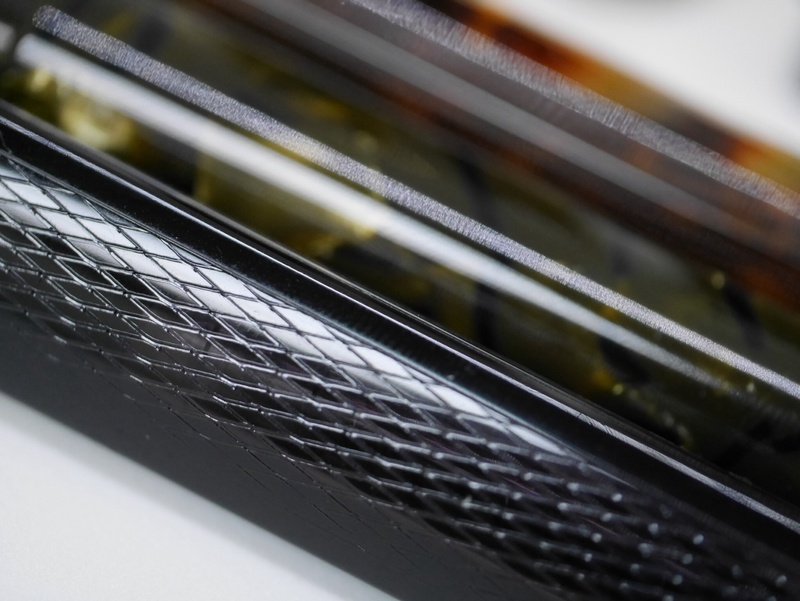 It is not close to being as rich or warm as celluloid, but OMAS cleverly make up for this by etching an intricate diamond weave pattern into both barrel and cap. 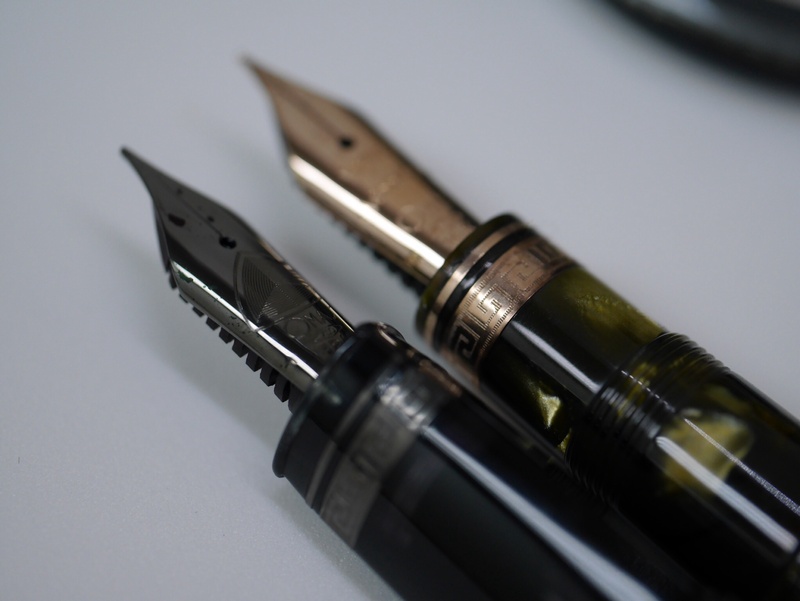 Ruthenium is wisely employed to trim this pen and the overall effect is dark without being flat. 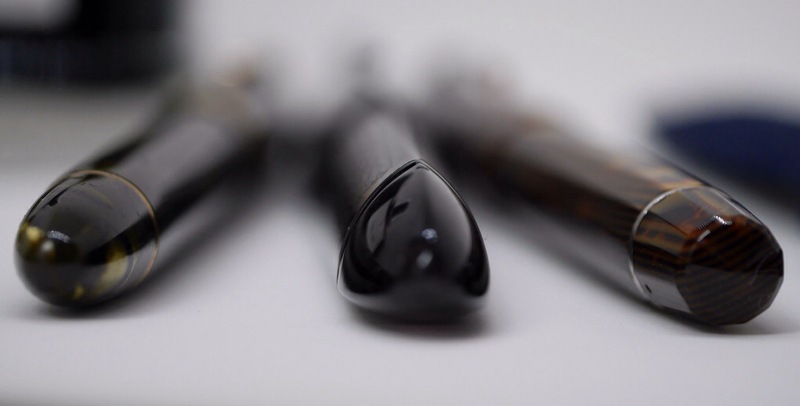 The resin retains some transparency and if you hold the pen to the light, you see not just the ink sloshing about but also a slight aubergine hue lurking beneath the material. 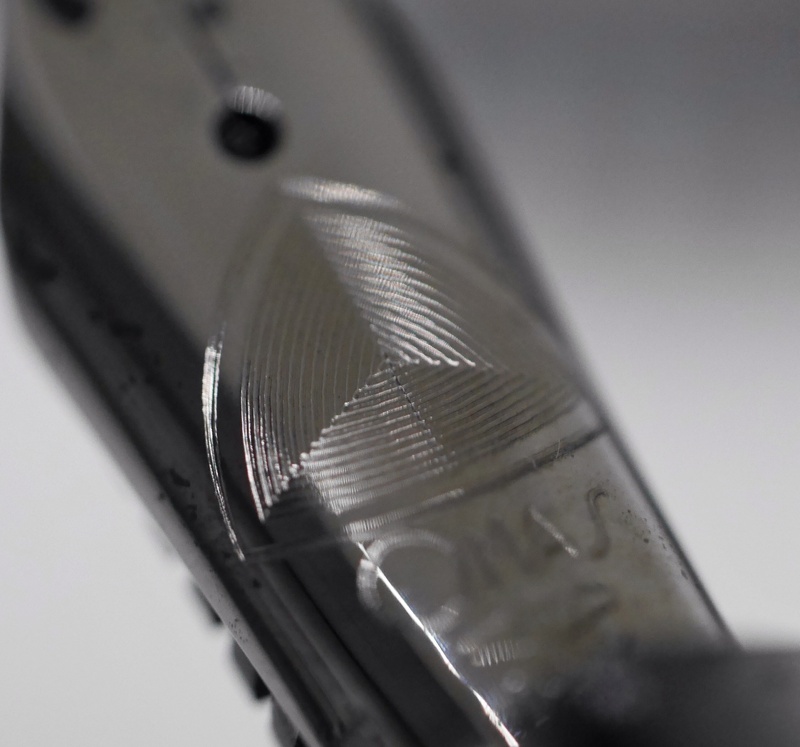 It is an über cool nuance and one of the small details that set OMAS apart from many other makers. The nib is a standard firm Fine. Well, firm isn’t completely accurate. It has a very (and I mean very) slight bit of give, which feels pleasant on paper. It also possesses a hint of feedback. Some may not like this but this is exactly how I prefer my fine nibs to behave. Flow is dry-ish but not arid, and gives some interesting variation to its cross-strokes. Compared to the Arte Italiana Noir that I wrote about recently, this one gave me no trouble at all. Even the nib ornamentation is a little passive aggressive on this one. So there you have the tale of two brothers. One struts about in Battistoni threads. The other dons Zilli leather before mounting a Ducati. It’s hard to choose between these two but luckily, I don’t have to.